September 17, 2013 - Chet Coppock, versatile radio and TV sportscaster who has been a fixture on the Chicago sports scene for over 30 years, is set to receive the Jack Brickhouse Lifetime Achievement Award from the Chicagoland Sports Hall of Fame during their 17th annual awards dinner tomorrow night. The award is named after sportscasting pioneer Jack Brickhouse, who called more than 5,000 Chicago Cubs and White Sox games, not to mention 24 years of Chicago Bears football, during his 40-year career. Brickhouse was a member of the American Sportscasters Association’s second Hall of Fame class in 1985, which included fellow sportscasting legends Mel Allen and Curt Gowdy, and served as an ASA Board Member from 1983 until his death in 1998. This honor is especially meaningful to Coppock, an ASA member for over 20 years, since early in his career he was introduced to Brickhouse by his father, and the two formed a close friendship. Coppock began his career as a young producer on the Milwaukee Buck Radio network during the 1970-71 season, the same year Kareem Abdul-Jabbar and Oscar Robertson led the team to an NBA Championship. After bouncing around at small stations in Chicago, he landed a job as the national TV voice of the Roller Derby, which was followed by a six-year tenure as Sports Director at WISH-TV in Indianapolis, where he shared an anchor desk with a young Jane Pauley. The 1980s saw Coppock take root in the Windy City. 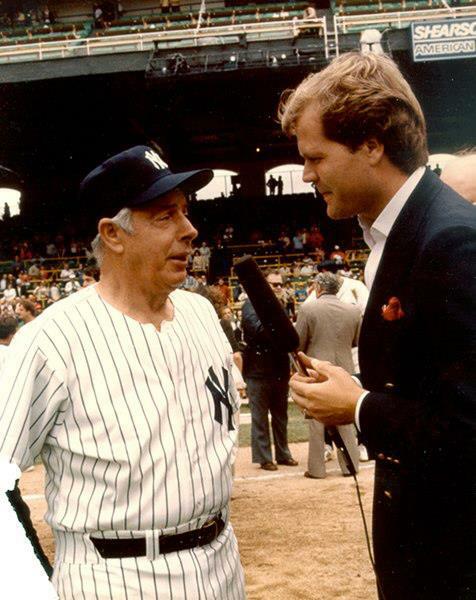 In 1984, while working as Sport Director at WMAQ Radio, he approached the station brass about doing an in-depth, interview-driven radio sports talk show. The move led to the creation of “Coppock on Sports,” a vehicle he used to travel coast-to-coast, speaking with athletes, coaches, GMs and media members. The show enjoyed huge success and laid the foundation for the 'sports magazine' format used today by any number of radio outlets. In 1988, Coppock moved his popular radio show to WLUP, and also hosted the pre-game, halftime and post-game shows for the Chicago Bulls Radio Network. Other assignments included co-hosting “The Mike Ditka Show” and shows featuring NBA coaches Phil Jackson and Doug Collins, as well as serving as the studio host for the NBA Radio Network. Coppock was able to fulfill one of his dreams - doing live TV in New York- when he was tabbed as the host of “NewSport Talk” on Cablevision’s short-lived 24-hour sports channel, NewSport, in 1994. The show lasted nearly four years and was a hit with the New York TV critics but unfortunately for Coppock, Cablevision decided to pull the plug on the station due to slow growth and lack of subscribers. It was back to Chicago in the late 1990s where Coppock had stints at Fox Sports Net and WMAQ Radio before reviving “Coppock on Sports,” which made its return to the airwaves on Sporting News Radio from 2000 -‘06. Currently, Coppock can be heard on Notre Dame football pre- and post-game shows on WLS Radio. He also publishes “Daily Coppock” videos and interviews on his website, dailycoppock.com and his “Coppock on Sports” audio podcasts are available on itunes. Among his other endeavors, Coppock has done national commercials for Wheaties with the late Walter Payton and for Chevy with Michael Jordan. His charity work includes serving as chairman of Indiana Easter Seals and March of Dimes campaigns, and scholarships have also been given in his name by the Better Boys’ Foundation and the National Italian American Hall of Fame.